Hello all :-) I had a good weekend. It was pretty calm. Brit Boy and I just hung out around home. I finally finished my project that I was doing for my school work, so I was glad to complete that. Today has turned out to be a lovely day here. It was kinda frosty this morning, but now it looks rather spring-like outside. It has been an extremely icy winter here and everywhere it seems, so I wanted to share a sneak peek of spring that I found today. And our crocuses out back are breaking through. It’s so nice to have some color outside again. This weekend I sat in front of my thriving in door lavender bush and closed my eyes and pretended the snow was gone..your pictures help, thank you! 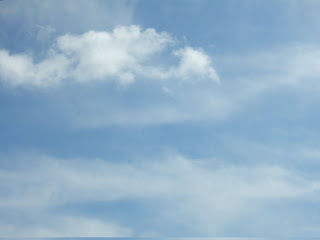 Today was a fantastically sunny day in Essex, it really cheered me up even though I couldnt go out in in as I was finishing off a project with a deadline. Bleh. 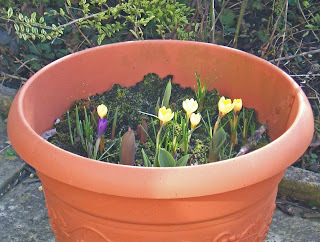 I love seeing the little bulbs peeking through, it is so reassuring that all this miserable greyness wont last forever! Thanks for the blue skies and the flowers. They are rather cheerful! Yes, here's to spring. It's warmer here than there, but the weather has been rainy much of the time. And we keep on getting sick. Can't wait for flowers and new growth. LOL. Yeah, I wondered about the right way to say it. LOL. Thanks for sharing the picture of the crocus! I am soooo jealous! I live in cold, snowy Michigan. Hopefully, we won't get anymore snow! I CAN NOT wait for Spring! Peace! I'm so glad you visited me :) Yeah, the crocuses are doing their thing! I feel for you with the snow. It has been a cold here this winter too and I'm so ready for full on spring! Bring it on! :) Thanks for visiting me.